Seaside Oregon is perfect for foodies and has over 30 delicious restaurants featuring everything from seafood, Mexican, Italian, Chinese, Tai Food, and more. Recreation is plentiful in Seaside including Shopping, Beach Combing, Bike Riding, and Surfing. Visit downtown to ride the bumper cars and play at the Arcade. Seaside has many fine lodging options including hotels, vacation homes, and camping. If your looking to stay on the ocean then check out the Shilo Inn or the Woldmark Resort. Just 70 miles West of Portland, Seaside, Oregon is the quintessential beach town of the Pacific Northwest. 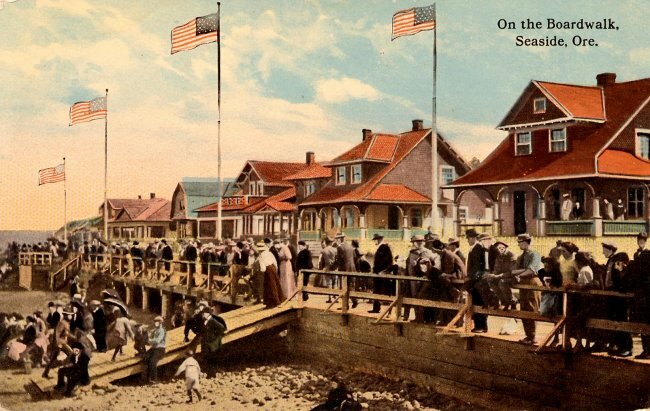 Beautiful beaches, boardwalks full of stands selling salt water taffy and souvenirs, tourists are often surprised to find that Seaside also harbors a rich history. Seaside has long been a choice location for human settlement. The town takes its name from Seaside House, a summer getaway built by the railroad tycoon Ben Holladay in the 1870s. Before Holladay built his resort and other settlers of European descent put down roots in the area, the Clatsop indigenous Americans lived along the coast. Their town was known in the Chinook language as Ne-co-tat. They were a fishing community who lived in “Long Houses” that stretched between 30 and 60 feet. Archeological digs in the 1970s unearthed artifacts that were found to be over 2000 years old.